ChildChild ages: 16-18 years old. . Looking for the perfect way to end your day? 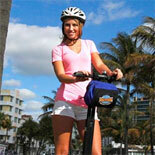 Embark on an exciting Segway glide through glamorous South Beach on the Segways at Sunset Tour. Discover the exclusive Art Deco district, beautiful beaches, trendy shops, and top attractions with the sun setting over the ocean as the backdrop.Bike and Roll your adventure in the City! Come glide on a scenic, romantic Segway tour, the Segways at Sunset Tour. featuring the new, safe and easy to ride, i2 Segways. You'll enjoy a tranquil glide around South Beach and South Point with all the spectacular views awash in dramatic hues as the sun lingers on the horizon. What is a Segway? The Segway is a two-wheeled, self-balancing, battery-powered electric vehicle. Computers and motors in the base of the device keep the Segway upright when powered on. A user commands the Segway to go forward by shifting their weight forward on the platform, and backward by shifting their weight backward. The Segway detects, as it balances, the change in its center of mass, and first establishes and then maintains a corresponding speed, forward or backward. Gyroscopic sensors and fluid-based leveling sensors detect the weight shift. To turn, the user presses the handlebar to the left or the right. Segway PTs are driven by electric motors and can go up to 12.5 miles per hour (20.1 km/h). South Point, in Miami Beach, is also referred to as SoFi, meaning "South of Fifth St." This luxurious area at the south end of Miami Beach is home of some of the most luxurious residences in the world. Featuring sandy beaches, high-end restaurants, Art Deco architecture, superb shopping, hip clubs, arts and cultural attractions, and endless recreational activities, South Beach is the center of Miami nightlife. Join this romantic sunset tour, ideal for taking photographs of South Beach as the sun sets over the ocean. These tours sell out quickly, so advance4 reservations are required. Make your reservations and get your eTickets now for a tour filled with romantic ambiance, the Segways at Sunset Tour! Tours operate daily: 5:00 pm (October-April); 6:00pm (May-September). Closed: May 15 - 28, thanksgiving, Dec 24 & 25. Please arrive at least 30 minutes prior to departure. Child Ticket: 16-18 years old. Tour participants must be at least 16 years of age. All participants must weigh at least 100 lbs. (45 kg) and no more than 260 lbs. (117 kg) and be in good health. Pregnant women may not participate in a segway tour ~ Please wear comfortable, closed-toe shoes and dress for the weather ~ Remember to bring: sunscreen, your camera for capturing all your great Miami segway memories, and a bottle of water ~ Gratuities for the guides are not included ~ Cancellations must be made at least 72 hours in advance. + Participants must read and sign the Release from Liability Agreement prior to rental/tour. + A Credit card and/or valid driver license or passport is required for rental deposit. + Helmets and locks are provided for free with rental. Helmets are recommended for all riders. + Participants under the age of 18 must wear a helmet! + Participants must be in good health, and able to operate, control and balance the equipment, at time of rental. Please consult your physician. + Participants are responsible for the rental equipment, from the time the equipment is rented until the time it is returned, including damage and theft of rental equipment. + Rental equipment is due back on the date/time printed on the Rental Receipt. + Late returns are subject to overtime charges and late fees. Due to the limited reserved seating and factors beyond the control of the operator, this product does not fall under the Trusted Tours and Attractions Guarantee program.